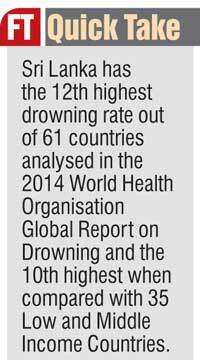 With over 850+ recorded deaths a year by drowning, Sri Lanka is sinking when it comes to delivering on its health and safety obligations in the water and the Government is yet to implement a national plan to reduce this alarmingly-high number. To tackle the second highest cause of death in Sri Lanka, it is not only imperative to implement a national plan but also ensure programs such as ‘Swim for Safety’ are made compulsory in schools islandwide as initial safety measures. Sri Lanka Life Saving (SLLS) is actively lobbying for the implementation of the National Plan for Water Safety and Drowning Prevention, which is yet to get off ground, while also imparting basic water safety education and survival floating techniques to thousands of school children with the aim of building a safer aquatic environment in Sri Lanka. Q: Could you tell us about Sri Lanka Life Saving (SLLS) and what services it offers in terms of lifesaving, training and education? 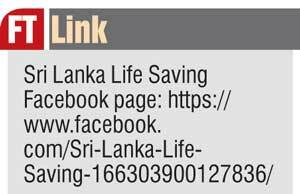 A: Sri Lanka Life Saving (SLLS) has a history over 70 years and it was previously known as Surf Life Saving Association of Ceylon and Life Saving Association of Sri Lanka. The vision of SLLS is to prevent drowning deaths and to assure safety in and around water. To overcome drowning and drowning-related deaths, SLLS works very closely with the tri forces, Sri Lanka Police, civil organisations, six Government ministries and various communities. To date, SLLS has trained more than one million civilians in the society on a volunteer basis and is in the process of streamlining and embedding those training sessions to the education system with the support of respective ministries, meeting internationally-recognised standards. Q: What are the key challenges facing SLLS, especially in terms of tackling the high drowning rate in Sri Lanka and in relation to equipment, personnel and training? A: The key challenge that SLLS has is getting the correct drowning numbers in a timely manner from the responsible parties. However, from 2014 onwards, as a result of the first-ever drowning report that was published under the patronage of the then Australian High Commissioner, SLLS was able to open the eyes of many individuals and organisations. Obtaining the required quantity of good equipment, storing facilities at key and most required positions, and maintaining them with due diligence could still be considered as challenges. Also, the lack of awareness shown by the society and not encouraging youngsters in their respective family circles to take swimming and lifesaving learning sessions while they are in school and out of school could also be considered as other key challenges. Q: Despite longstanding efforts by SLLS and many lives saved over the years, there isn’t enough being done to bring down the number of deaths by drowning, which is the second highest cause of death in Sri Lanka. What are the key steps that need to be taken to tackle this situation? A: Since Sri Lanka as a country was not aware of the size of the issue and had not paid the right attention to identify the issue, the Drowning Reports that were published by the World Health Organization (WHO) and SLLS in 2014 were helpful in showing where Sri Lanka stands in this regard on the world map. The report that was published by SLLS was especially able to provide the numbers for all provinces and then the issue was recognised as not identical but unique to each province. As a result, SLLS reached out to the Disaster Management Centre (DMC) and emphasised the importance of formalising a ‘National Action Plan’ so that Sri Lanka would be able to reduce drowning numbers as it would be scaled as a gradual process in reducing the numbers. The process has multifaceted activities and those activities were identified as the ‘Recommendations’ stated in the WHO report in relation to Sri Lanka. Q: What is the current situation in relation to the implementation of a National Plan for Water Safety and Drowning Prevention, which SLLS has been lobbying for? A: The National Plan will have various strategies to address the issue and results will be assessed at regular intervals. There will be key stakeholders and they are expected to share their knowledge and experiences at their respective forums so that the governance team at the national level will feed that information to the national level of driving activity. The key message the governance team is trying to convey would be that “everyone is equally responsible” so that the services rendered will be treated as a great humanitarian activity. Although the whole process has got indefinitely delayed due to unforeseen reasons, it is on track to commence at any time. SLLS along with its key stakeholders meanwhile continues its uninterrupted volunteer services with prolonged activities. Q: What are the basic qualifications required to become as a lifeguard in Sri Lanka and how does one obtain training and certification? A: To be recognised as a lifeguard, the individuals should have obtained either a ‘Pool Lifeguard’ or ‘Surf Lifeguard’ qualification. If anyone is interested in attending any of these training sessions, they can consult SLLS or Associate or Full Member institutions listed and registered under SLLS. However, the examinations can be conducted only by SLLS and its qualified examiners as SLLS is the only governing body that is allowed to issue a world-recognised qualification within Sri Lankan territory. Q: Could you tell us about the foreign employment opportunities, especially in relation to the high demand from Middle Eastern countries for female lifeguards? A: The employment opportunity which has been opened up in the Middle Eastern countries has been identified as a ‘skilled labour’. It is rather unfortunate that the female engagement in the country is not that great and we are losing the opportunity to our neighbouring Asian nations. However, as a consequence of the recently-completed ‘Female Leadership Program,’ SLLS expects to take the message to females and encourage them to be on par with males so that the requirement could be fulfilled. The visibility that has already been created by the males is at a very high level and they were able to raise the bar of Sri Lankan presence in most of the Middle Eastern countries. Hopefully, the female segment would also thrive with the recent-concluded female leadership activity. Q: What are the services SLLS can provide the tourism industry in relation to water safety? A: SLLS can provide a service through qualified lifeguards so that they can rest assured that safety in and around water in both pool and beach environments is ensured. Those qualified lifeguards are educated in many safety aspects relating to water, covering both before you get into and after you get into waters. More importantly, they have been taught key aspects of first aid and in case of an emergency, they will know what to do until the patient is taken care of by a qualified doctor. Through this qualified lifeguard service, the tourism industry could completely do away from the ‘Swim at your own risk’ signage at pools and ‘red flag zones’ in beaches, which in turn will help hoteliers to attract more tourists to their beautiful beaches and generate sustainable incomes. Q: Can SLLS provide assistance in terms of design to make pools safer and can corporates reach out to SLLS in this regard? A: SLLS can assist anyone with ‘pool safety guidelines,’ wherein the owners could ensure safety in a pool environment. Similarly, ‘beach safety guidelines’ are also available to ensure safety in beaches. However, ‘make pools safer’ is not within the SLLS frame now although it may be included in future activities. Q: School pools and hotels need qualified lifeguards. Can SLLS meet this need and what is the process? A: SLLS has already organised lifesaving programs for schools and other organisations of Sri Lanka, which are internationally recognised since 2012. We have conducted internationally-recognised courses and completed the 45th Pool Life Guard course recently. Through those training programs that have been conducted over the years, SLLS has up-skilled more than 2,000 qualified pool lifeguards from schools and hotels and over 2,000 active lifesavers who carry out their duties around the island. Every year, SLLS carries out renewal programs which have brought an additional benefit to both individuals and SLLS. Through our renewal programs, individuals can further enhance their knowledge to on par with world standards whilst maintaining a very close and a strong relationship with SLLS to move to a better future. Q: Could you outline the ‘Swim for Safety’ program and the importance of making it compulsory in all schools islandwide, how it is carried out in Sri Lanka, the cost factor and so on? A: The ‘Swim for Safety’ program has been identified as a key and a primary activity that should be carried out within the community as recommended by the National Action Plan, to reduce drowning deaths. It is meant to identify risks, what actions could be taken as preventive actions in a real time/life scenario and more importantly, knowing what to and not to do in case of a water-related accident. The advantages of making it compulsory at school levels would be to provide education relating to floating and identifying threats but not to panic and helping others overcome danger or an unusual situation. It is run as a 12-lesson program and in the end, the participants would know at least to swim 25 metres (moving from one end to another using any stroke) and know at least one swimming technique so that they are assured of another chance of living. Q: According to SLLS, just two questions on drowning being included in the Year 5 scholarship will help create awareness and bring down the death by drowning rate. Could you expand on this? A: When a swimming lesson is taken, the leaner is assured of their own safety in and around water but not about that of any others. When it comes to lifesaving, it is meant that learning is used to save at least another life that is in distress in water. When the program is added to a school curriculum, the expectation would be to make pupils aware of safety so that they could be aware and share the same with their family circles and among society. Making society aware of lifesaving techniques will in turn help them in assessing water-related dangers and in taking preventive or mitigation actions. Drowning deaths can be minimised through proper and continuous education. Q: What are the local lifesaving programs in operation and what role do volunteers play? A: Through our volunteer force of more than 50 affiliates, we were able to train more than 50,000 school children with basic water safety education and survival floating, aiming to build a safer aquatic environment in Sri Lanka. More than 90% of the work force mentioned above is based around Sri Lanka Police stations, especially in rural areas, and conducts regular volunteer training programs. Those Police personnel have been trained and qualified as instructors by SLLS. We also have more than 120 active instructors within our 50 affiliates and they have locally trained a good crowd of junior instructors who have the ability and skills to train even individuals in village areas. The best highlight of the above would be SLLS being able to reach out to the north and east areas of the country and form a few clubs and train individuals who can in turn conduct training sessions for locals. A few of these locations are the Trinco Life Saving Club, Kantale Life Saving Club, Mullaitivu Life Saving Club – Sri Lanka Army 2 SF Diving team, Ampara Life Saving Club, Jaffna Red Cross Branch and Arugambay – Sri Lanka Police STF Life Saving Unit. Q: What are the challenges in promoting a consistent red and yellow message in Sri Lanka in line with international lifesaving colours? A: The challenge that SLLS foresees in promoting a ‘red and yellow’ message or a culture is that the community is not aware of international signage relating to water safety. The red and yellow flag on a beach is meant to be a safer beach for swimming where as a red flag indicates the opposite. The importance of getting into water between red and yellow flags is considered as a ‘pre-education’ and it should be communicated either on site or through both printed and digital media. The simple message that we could carry to the community would be whenever or wherever they see a person who wears red and yellow, they would be either a life guard or signify a safer beach and red and yellow flags mirror an area where the dangers in water are minimised, observed or constantly monitored by the qualified lifeguards who could help another while they engage in water-related recreational activity.